The fancier the Goldfish variety, the more likely it is that you will have spawning problems. If you had a successful breeding season, congratulations. If your fish didn’t perform as expected, don’t give up as it can happen to anyone. I experienced a problem with Water Bubble Eyes last season. I purchased a trio from a local fish shop while picking up my Repashy gel food. What made me impulse buy them was because it was early in the breeding season and they looked as if they had recently spawned. As it was many years since I had bred any Bubble Eyes I thought it was a good opportunity to get a head start on developing a line of quality fish again. The trio were in about 25C (77F) which is what probably caused them to spawn early. 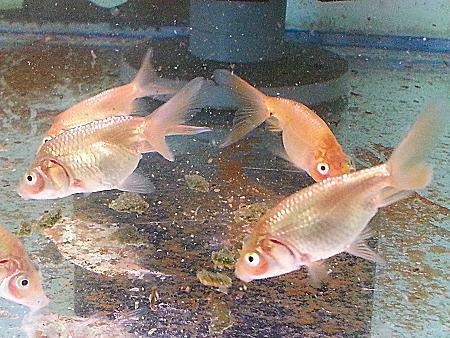 I brought them home, dosed for parasites and fed them all the daphnia they could eat. As it was early in the breeding season and outside temperatures were quite cool, I calculated it would be about 6 weeks before I would need to start watching for spawning activity. I had them inside in an aquarium at about 18C (64F) and noticed the males lost the few breeding tubercles they had. I put this down to the lower temperatures but expected them to regain them when temperatures rose. Six weeks later and not a single breeding tubercle on the males. As the breeding season had arrived, I was getting concerned that I was going to miss the breeding season. Had I upset their seasonal cycle by keeping them in low water temperatures? Was the artificial lighting too low? Did they have internal parasites as they were constantly hungry? How old were these fish? Had the fish shop sterilized them? (I was getting desperate). By late summer and no success I was suspecting the female had become sterile. I gave up trying to spawn them and decided I would go through a winter hibernation cycle in the hope that they would spawn the next season. For added insurance I purchased another small pair of fish that would replace the trio if they didn't spawn. Early spring arrives, and no breeding tubercles on the males. A month later and still no breeding tubercles. Water temperatures were un-seasonally low so I installed a heater to bring the water temperature up to 22C (72F) and put the small pair in with the trio. Voila! 6 days later a small spawn from the small female. Nothing from the large female. I am now convinced she is sterile although giving all indications she is ready to spawn. The males are showing only a few breeding tubercles. 3 weeks later another spawn from the small female. I caught the large female and gently rubbed her sides to see if she was releasing eggs. Nothing. The next day the large female spawned. The image above shows some of the fry at 10 weeks with their bubbles showing quite clearly. Males from some genetic lines don't display many breeding tubercles. I had read about this but never experienced it. Some fancy varieties require higher temperatures to spawn. Always expect the unexpected with fancy Goldfish. If you are having difficulty getting your fish to spawn, don’t assume that all varieties will behave the same way. Fancy varieties rarely give any indication that they are about to spawn. All you can do is provide ideal conditions, feed live food daily, do partial water changes, and wait. 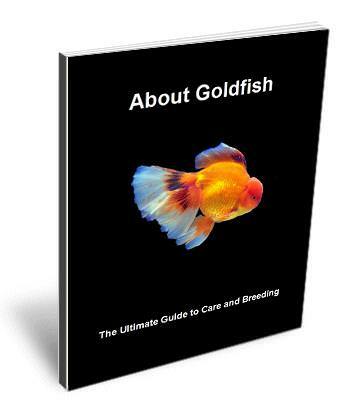 A big thank you to those who provided feedback on my e-Book About Goldfish - The ultimate Guide to Care and Breeding, and I hope you get value from the final version I have sent you. There is still time for those who requested the draft copy to send in feedback and receive a free copy. Some of the feedback received so far concerned the size of the e-Book, (200+ pages),and it was suggested smaller subject specific books would be more popular for some. In response to this I have compiled a much smaller (49 pages) e-Book on Goldfish Breeding - How to successfully raise Goldfish Fry.